The optics of this normalization are just as bad as the facts on the ground. After invading Ukraine (where Putin’s hybrid aggression continues to claim lives), annexing Crimea, downing the Malaysian flight MH17, military and political support for the Assad regime, in spite of chemical attacks and the ongoing massacre of civilians, the Skripal poisoning, election interference in the U.S. and Europe — having not done a single thing to address or remedy the situation, Russia is about to be welcomed into the fold by the President of the most powerful country on earth. On June 26, 2018, U.S. Energy Secretary Rick Perry met with his Russian counterpart, energy minister Alexander Novak. According to the Russian state media, the meeting included discussions about Nord Stream 2, a controversial pipeline that is officially opposed by the U.S. The cherry atop Putin’s World Cup sundae is a real coup de grâce for the Kremlin. Instead of being rightfully treated like the world’s pariah, Putin’s Russia is about to be rewarded with the inexplicable pilgrimage of American officials. A group of Republican lawmakers will celebrate American Independence Day, the 4th of July, in Moscow. Louisiana Sen. John Kennedy, Alabama Sen. Richard Shelby, Montana Sen. Steve Daines, North Dakota Sen. John Hoeven, South Dakota Sen. John Thune, Kansas Sen. Jerry Moran and Texas congresswoman Kay Granger are heading to Russia, hoping to meet with Putin. “Joking” about Trump’s perceived allegiance to Russia, hackers, troll factories, election interference, etc. is nothing less than a strategy, designed to mock these concepts, presenting them as something that is too ridiculous to be true, too outlandish, absurd and therefore no longer believable. In spite of these efforts, most Americans aren’t laughing. Adding more fuel to the fire, U.S. national security adviser John Bolton is setting the stage for the Trump-Putin summit, as opposed to Secretary of State Mike Pompeo. The Russians speculate that Bolton will be representing Trump’s own agenda, while intentionally cutting out the State Department. Needless to say, they anticipate that Trump’s agenda will closely align with that of Vladimir Putin. Russian state media, closely aligned with the Kremlin, predicts that Trump will make concessions to Putin. They even suggest it wouldn’t hurt “to ask for the return of NATO to its pre-1991 borders.” Regardless of the outcome, state TV pundits advocate that Russia should use the summit to its advantage, by demonstrating that the consolidated West and transatlantic unity ceased to exist. Trump’s outreach to Putin provides an enormous agitprop gift that will be used to full capacity in Russia’s ongoing info-wars against the West. 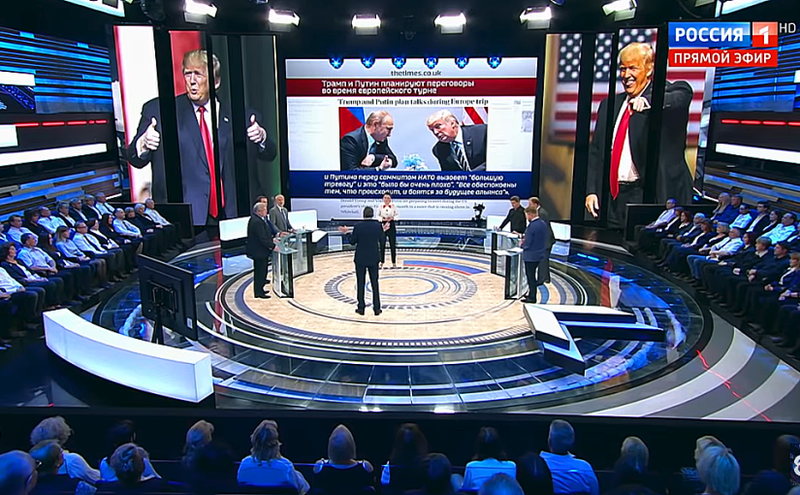 On various state TV programs, Russian politicians, experts and talking heads speculate that the agreement Putin and Trump will sign at the summit has already been finalized and will contain nothing more than generalized statements about cooperation in combating terrorism, continued deconfliction in Syria and other “common goals.” They repeatedly predict that a secret, verbal agreement will be entered into with respect to Ukraine, with Trump agreeing to look the other way, while Putin intensifies the ongoing aggression. All in all, the Russians are continuing to reiterate their mantra, “Trump is ours,” feeling giddy about the possibility of sanctions not being enforced in exchange for – well, nothing. Since the Kremlin concedes nothing and has no intention of ceasing its hostilities, “getting along with Russia” in lieu of holding it accountable is tantamount to total capitulation. In the meantime, Russia continues to hope that America destroys itself, the EU dies and the pro-Russian government officials in Italy and Austria get in the way of renewing the sanctions. Putin’s state media is already using the impending summit as a propaganda victory. Only time will tell just how much of our security and transatlantic unity will be given away in exchange for photo ops with an unabashed authoritarian and empty promises of “cooperation” with our adversary.